Juncker Heads to Western Balkans to Discuss EU Strategy - Integration Through Media ....! 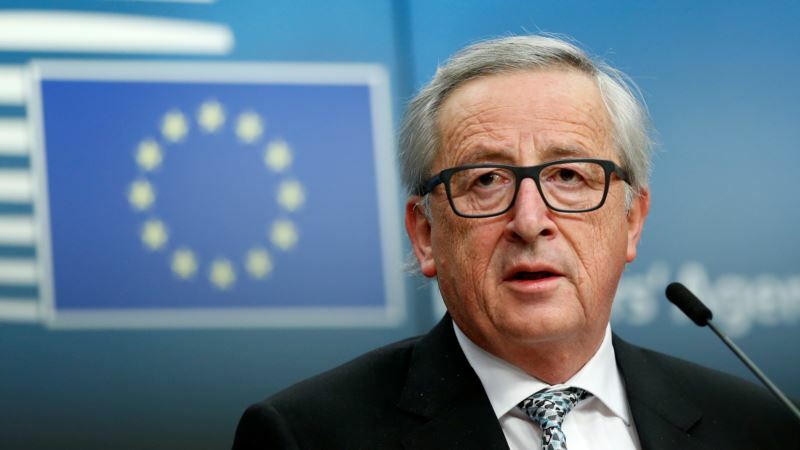 (VOA): European Commission President Jean-Claude Juncker is embarking on a Western Balkan tour to promote the EU's new strategy for the region. Juncker's tour to the six Balkan countries that remain outside the European Union starts in Macedonia, where he will hold talks with Prime Minister Zoran Zaev on Sunday. Earlier this month, the European Commission unveiled its new strategy to integrate Albania, Bosnia-Herzegovina, Kosovo, Macedonia, Montenegro, and Serbia. Among the six countries, the commission considers Serbia and Montenegro as current front-runners toward accession and the new strategy says they could be allowed in by 2025 if they meet all the conditions. “The EU door is open to further accessions when, and only when, the individual countries have met the criteria,” the EU road map said. It insisted that the six countries still have many obstacles to overcome before joining the bloc, including regarding corruption, the rule of law, and relations with their neighbors. EU member states Croatia and Slovenia are still locked in a border dispute stemming from the breakup of Yugoslavia in the 1990s. Macedonia and EU-member Greece are engaged in UN-mediated talks to resolve a 27-year-old dispute over the name of the former Yugoslav republic. The EU-sponsored dialogue between Belgrade and Pristina has produced agreements in areas such as freedom of movement, justice, and the status of the Serbian minority in Kosovo — as well as enabling Serbia to start EU accession talks and Brussels to sign an Association Agreement with Kosovo. Juncker’ strip to the Western Balkans comes after Russian Foreign Minister Sergei Lavrov traveled to Belgrade this week for a two-day visit aimed at bolstering longstanding ties with Serbia. During the visit, Lavrov welcomed Serbia’s drive to join the EU, but also vowed that Moscow would remain engaged with the Balkan country no matter what happens. “We always wanted partners to have a free choice and develop their political ties,” Lavrov said at a news conference with President Aleksandar Vucic, who is leading Serbia through a delicate balancing act. Although Serbia is seeking to join the EU, it continues to nurture close ties with Moscow and has said it will not join the EU's economic sanctions against Russia over its aggression in Ukraine.